I'm moving cities, and I'm bringing two suitcases of stuff, plus a duffel bag. 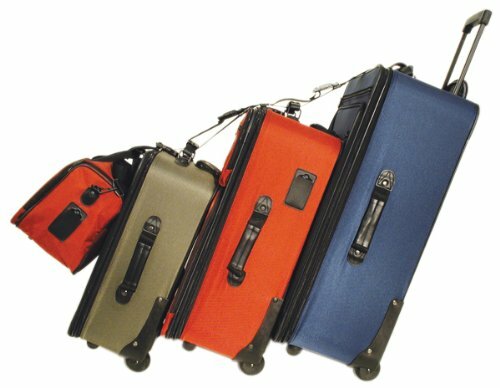 The suitcases are four-wheeled, with extendable handles. The hotel I'll be staying at is about 500 m from the shuttle drop-off point. Not far enough to warrant catching a taxi. And there'll be other times as I switch AirBnbs that I'll be moving around similar distances. The thing is, two suitcases seems like an awkward amount of luggage to transport. If I'm doing one in each hand by my sides - I'll likely be using a lot of sidewalk space. And they might keep turning and flipping. Is there a technique that I'm unaware of that makes transporting multiple wheeled suitcases easier? Two 20-kg suitcases? That's my regular vacation luggage ;-). I had at least 100 kg of total luggage when I relocated by train in 2008, foolishly thinking "no luggage limits on the train!". It included a 35 kg duffel bag without wheels — it took me 45 minutes to change platforms at København Hovedbanegård. That's what a student budget means (total money spent on 2500 km relocation: <€100). Having used both 2- and 4-wheel suitcases, I do not recommend 4-wheelers for street use. I recommend suitcases with big, solid wheels. I use the Eagle Creek Exploration Series ORV Trunk 30. They use skateboard wheels. You can walk with two of them, dragging one behind you in each hand. Their sides will touch each other and you will be rather wide, so be prepared to stop to let others pass. Take enough time, don't be in a rush. Some have suggested pushing two heavy 4-wheelers in front of you. It may work in airport terminals and hotel lounges. It won't work out in the real world on any tiled pavement. The slightest discontinuity between tiles will make the suitcases tend to fall over forward. Here in England, such discontinuities are many. It may work on a street with smooth tarmac, but even on most streets, there may simply be too much friction, in particular when both are heavily loaded. The last time I tried to push two 4-wheeled suitcases in front of me on a tiled pavement, I lost one wheel and damaged two others beyond repair. I find that when heavily loaded in the real world, I need to pull the suitcase behind me on 2 wheels anyway, and then a dedicated 2-wheeler with good wheels performs better. It is going to be awkward regardless but some suitcases can be attached together into a chain. It is still cumbersome because you must pull them steadily for one not to fall and pull the other one down. For such a small distance you can pull one on two wheels and push the other in front of you. Pushing works better with 4-wheel suitcases, otherwise do as you suggest. In some cases, I have dragged a suitcase or two on the street next to parked cars since that often has fewer obstacles than a sidewalk but that vastly depends on the city and where you are in the world. In Vietnam for example, there is no room on sidewalks but noone says anything if you carry suitcases for kilometers on the street. As you said, the distance is really small. Consider that many airports have longer distances inside and there many places where taxis simply cannot get close to the hotel, pedestrian cities, places with long stairs leading to your destination, etc. In many parts of the world, you will be required to carry your stuff that far even if you hire a taxi. For some reason I missed that you also have a duffel. As someone in the comments pointed out, the best is to stack it over one of your suitcases. If you are pushing one ahead of you, then the duffel is probably best there since you can keep an eye on it in case it falls or gets off balance. Help it stay put by passing the rolling suitcase hand through the duffel bag handles. The only convenient solution is to just take a cab, regardless of how small the distance seems. You will pay quite a lot of money per kilometre as all taxis have a fixed starting fee, but it will save you an awkward walk with 2+ suitcases. Other options include always taking a taxi directly to your hotel rather than using a shuttle or making sure you don't have to relocate anywhere during your stay. That's more expensive, but when traveling with a lot of luggage you often have to take compromises in either the ease or the cost of getting around. Take the opportunity to get a free workout without paying gym subs, by carrying them. I have a personal loathing for suitcases on wheels, and the pilots thereof, and will always carry mine until the day I physically can't. There are plenty of opportunities for a free workout, and this is one of them. It always amazes me that people get really stroppy if they can't park close to the door of a gym, and then wheel their bag to the changing room so that they can pay to lift things. Yes, this is partially tongue-in-cheek, but only partially. 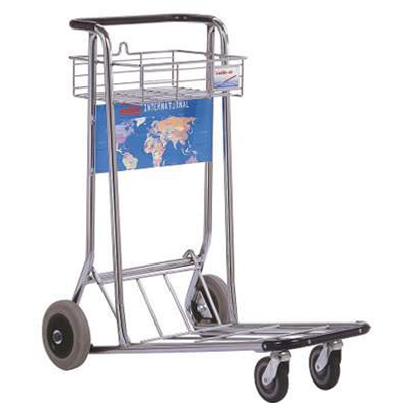 You may want to try foldable luggage carts. They are way more stable to push or pull than suitcases with their tiny wheels. If you choose a bigger one, you may even be able to strap two suitcases onto one carrier. There are different models out there. Some models are even usable with staircases (or curbs) thanks to 3 wheels on each side. Just search for them and select a model that suits you. Unless you have trouble physically dragging the suitcases, I'd suggest to just allocate a lot of time for your trip and yield to other pedestrians as appropriate. With extra time in your hands you can rest and switch posture as needed, to avoid straining (or injuring!) your body. Being in a hurry will only make make the trip more stressful for you and everybody else on the sidewalk. Source: I travel regularly with 8+23 Kg suitcases, and have made the occasional trip with 8+23+23. One option is to use two four-wheeled suitcases, and stand both of them upright in front of you, handles/backs together. You can then simply wheel them along. This removes your worry of the suitcases/turning flipping (an issue with two-wheeled suitcases), and it will take up much less space than wheeling two suitcases along behind you. I've pulled one in each hand, and it works, but you're right that you take up a lot of space. Also you need good cases (a wide wheelbase, but fairly narrow wheels) and to load them with the heavy stuff near the wheels for stability. Another option is to put as much weight as possible in one case and pull it, carrying the other in the other hand. You may need to repack for the flight. 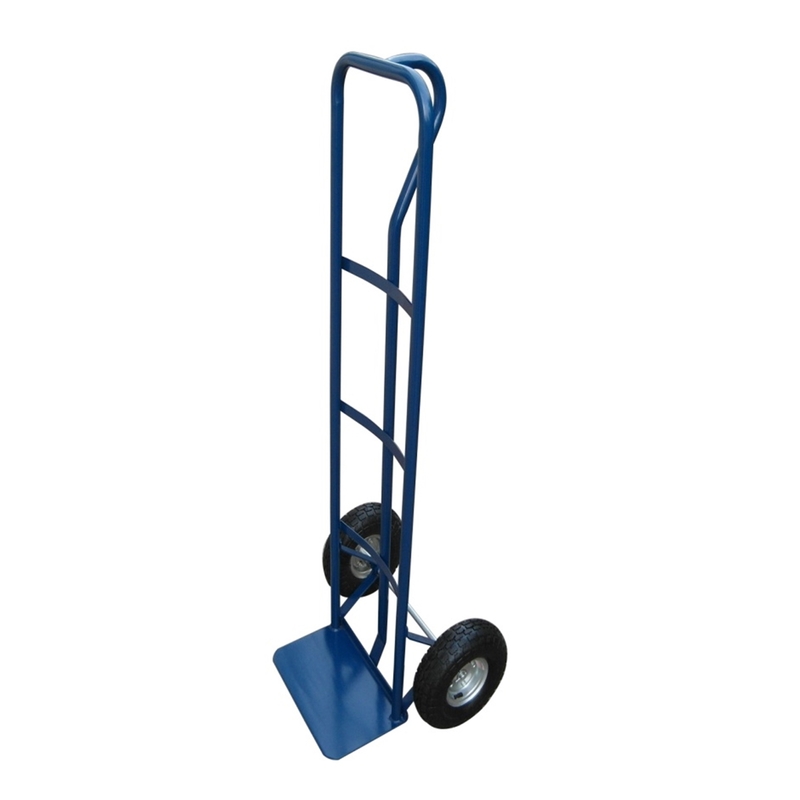 A small wheeled case can be put on its side on top of a larger one and strapped down firmly. Again you may need to repack as the small case should be heavy for the flight and light for the walk. Hopefully you can wear the duffel bag like a rucksack, or strap it on top of one of the cases if you're pulling both. Get help. If you know anyone in your destination city, ask if they would help you. Offer a small amount of money for their troubles if they are not close to you. You can also do the same thing online, ask on Facebook, Craigslist or whatever your local equivalent is, for someone willing to help you move a suitcase for 500m for $5 or something. Yes, there is a small risk involved, but that someone runs away with a 20+ kg suitcase doesn't seem very likely. A taxi might not be much more expensive, and in many countries the laws are very clear in that a taxi cannot refuse a ride just because it is a very short distance. These are the wrong $5 to save. I'm surprised that nobody else has mentioned moving one bag at a time. Sure, this wouldn't work from the shuttle to the first hotel, but most hotels will allow you to store your bags at the front desk for short amount of time after you've checked out. You could bring one bag, then go back for the other later. 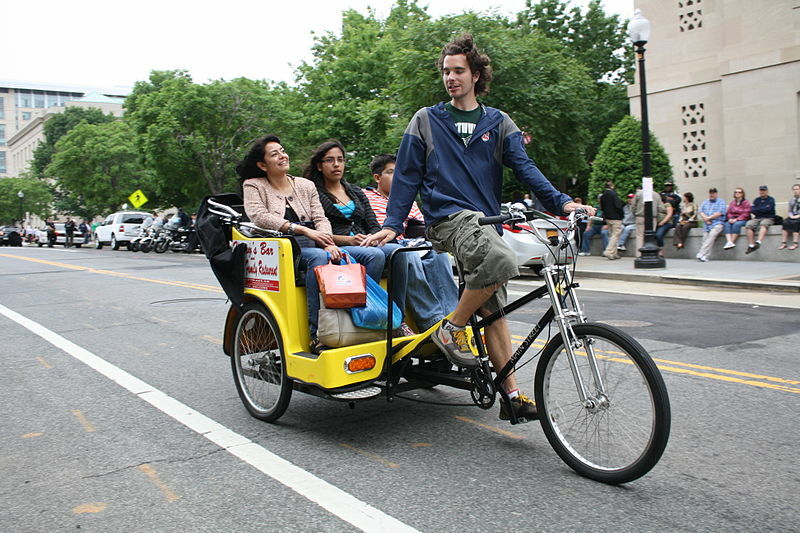 Depending on city there might be peditaxis available that might be cheaper than regular taxis. I would suggest calling in advance to see if they are able to accommodate two suitcases. why dont u try putting one case sideways above the other with its handle already extended so that the handles bars hold them and then push it in front of u? i've been in this situatuation and this is what i normally do. I used to do this with large wheeled containers for field service. You push one in front of you and pull one behind you. Takes some strength and balance; Dont know if I could still do it now. Had to unload from car, walk into the building down a very long hallway thru other doors into a cleanroom. The first day? I was pulling both behind me and they would cross and tip over. Sir, I know you probably have a fixed route, but my final destination is just a couple of minutes down the road. Would you consider taking me all the way there? I'll make it worth your while. If the driver accepts, then be sure to give a generous tip. Obviously the amount will depend on local customs (as will the likely success of this method). Otherwise, I think I'd just get a taxi. Stand the two cases front of one to back of the other. Use an additional bungee cord to attach the duffel bag to the top of the contraption. Extend the pulling handle of the case that's left exposed. Tilt both cases, allowing one to slide against the other until they're both at a comfortable angle with their wheels on the ground. Sure, it'll take a few minutes to set up, but you can practice at home to get a good feel for how tight they need to be connected to maintain control of the 2nd case. Also, you may need to specifically attach the duffel to one case, not both, to allow for the tops to shift when they're tilted. *It seems they make straps specifically for this purpose that don't appear to be elastic. Here's the one from which that image was stolen borrowed. The straps aren't terribly expensive, but bungee cords should be even less so and they're handy to have around the house/car. Secure them together. I've seen suggestions about one in front of the other, but you could put them side-by-side and wrap a couple bungee cords around them. This would make them more stable and you should be able to push or pull them straight ahead/behind you, taking less room overall than dragging one with each hand. I was in a similar situation sometime back. I purchased a 25$ hand trolley from local hardware store (Bunnings in my case) and stacked the suitcases sideways and fastened them with some nylon rope. The trolley looked something like this. In summary: Just ask. Most people will help you if they have the time. I have done it several times. Best is to get a luggage belt or a chain. Tye the 2 4 wheelers with the luggege belt. carry the duffel bag in other hand. It will be more convenient if you get 3rd luggage with wheels too. Then you can drag it in front of you and the other 2 behind you. For the first situation, where your hotel is 500m from the airport, could you not walk to the airport without your luggage, fetch one of those trolleys, bring it back to the hotel and use it to carry back to the airport? I admit, this doesn't really answer your question, but it might help. Other answers have already covered the suitcase problem. I've just got back from holiday myself with two 20kg suitcases which I pulled in each hand for the length of the airport terminal and around 300m along rough pavements (sidewalks, for our American cousins) to the car park. No problems at all. For the duffel, my recommendation is not to use it. Instead, get yourself a rucksack. There would be no problems carrying another 20kg in that.